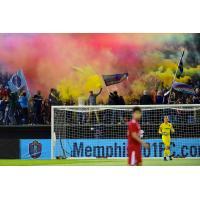 MEMPHIS, Tennessee - This week wasn't easy for Memphis 901 FC forward Elliot Collier. "It was very tough," Collier said. "I actually had a friend that I played with, I found out this morning that didn't make it through his surgery. "The team has been great. They're always there asking if I need anyone to talk to, trying to keep my mind off it, keep me positive and keep me locked in for the game." "It was a huge goal for the club, tying the game and also for my country," Collier said. "That's why I had the black band for this game. I knew today that I was going to score for them." Collier's goal helped Memphis rally back from a 1-0 halftime deficit to Loudoun United FC (0-1-1, 1 pt) at home and helped 901 FC (0-1-1, 1 pt) earn the first point in club history. For head coach Tim Mulqueen, Collier's goal was important on many levels. "I'm proud of the boys and I'm proud of the club for getting the first point in club history and Elliot (Collier) getting the first goal in club history," Mulqueen said. "A lot of firsts tonight and we're proud to be a part of it." Collier spent a majority of the post-match reflecting on his week and how meaningful Saturday night's result in front of 7,250 fans at AutoZone Park was. "It's been a rough past couple of days," Collier said. "That's been something that I had to deal with. But it doesn't change the fact that I'm out here to do what I got to do and score goals and play this game and do it for Memphis."